Congratulations to our CRS Triple C winners! We celebrate our Triple C award winners from Chestnut Ridge Elementary School. 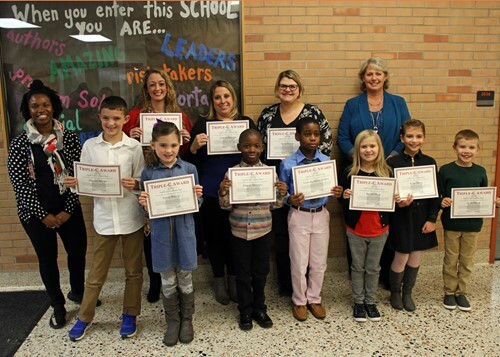 Shown here with Assistant Principal Jennifer Dixon (far left) and Principal Kimberly Hale (back, far right) they are (Front, l-r) Braylen Dilone, Kallie Weaver, Omare Akinpelu, Aaron Kpodjia Glikpanu, Kenadi Heeg, Riley Marra, Grant Marra. (Back, l-r) Kim Reap, Jessica Keipper and Holly Comas.